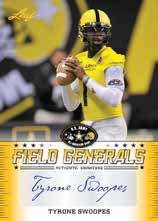 2013 Leaf US Army All-American Bowl Football takes gridiron prospecting to another level. The release features top high school players who participated in the annual all-star game. 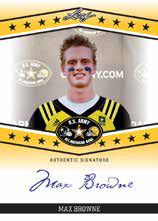 Every card in the set is autographed. 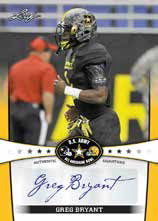 Limited to just 99 12-box cases, the print run for 2013 Leaf US Army All-American Bowl Football is very low. Not only are all cards signed, but they're limited to 50 copies or less. Among the players on the checklist are Tyrone Swoopes, Derrick Green, Jaylon Smith, Greg Bryant, Ricky Seals-Jones and Max Browne. 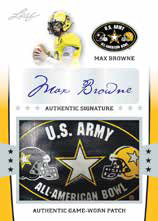 Besides basic autographs, the set also has a handful of autographed inserts including Autographed Jersey Cards, Field Generals, Big Hitters and Touchdown Kings. 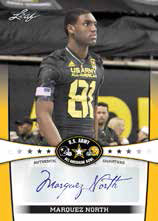 Since it began 12 years ago, more than 200 future NFL players have participated in the US Army All-American Bowl, including Andrew Luck, Adrian Peterson and Tim Tebow.